Pearls are not only one of the world's most popular gems used in jewelry, but they are definitely unique from many other gemstones. Pearls are not a stone at all. They are formed inside a living freshwater or seawater mollusk when either a micro-organism, or a small particle of shell or debris, either finds its way, or is humanly implanted, inside the fleshy interior of the mollusk. The mollusk becomes irritated by this, and coats the tiny piece with multiple layers of nacre, which over time forms a pearl. Pearls are also the only gem that is not cut, shaped or polished before it is set in jewelry. They are perfect to use as they are, and come in many colors, shapes and sizes. It is believed that about only one-half of 1% of all pearls are natural. 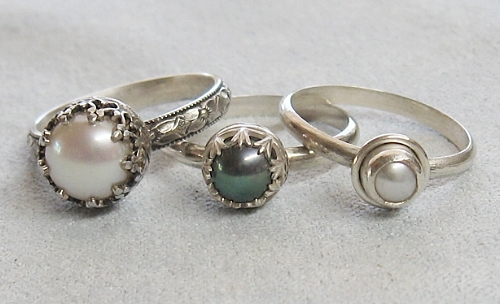 So, most of the pearls you find in today's jewelry have been cultured by man in oyster farms. Both Japan and China dominate this market. Almost all freshwater pearls, which are the most popular pearls, are cultivated in lakes, ponds and rivers of China, while the popular akoya pearls are farmed in the seawaters of both China and Japan. Because pearls have been around for centuries, it is believed that they were quite possibly the earliest gem used for adornment. Tales and stories abound about them from the ancient Persians who thought they were the tears of the gods, to the ancient Greeks who believed that pearls were formed when moonlight hit the water. Probably one of the most popular pearl folktales is one about the Egyptian queen, Cleopatra, who wanted to impress Marc Anthony and prove that Egypt was wealthier than Rome. She dropped a large pearl from a pair of her earrings into a goblet of wine where it dissolved, and then drank it down. Supposedly, Anthony was astonished, and my guess a little bit nauseated, and admitted that Cleopatra's Egypt was a very wealthy country that rivaled that of his Roman Empire. Pearls are said to hold magic as well. It is believed that they embody the power and life-sustaining properties of water. And depending upon what you believe, they can bring the wearer good or bad luck . Those who believe pearls bring good luck say they attract love, money and protection, and give the wearer a sense of calmness, and promote faith and loyalty. Those who believe pearls bring bad luck, say the wearer or owner of the pearl will have a heavy debt to pay in life because the pearl is taken from a living being which must be killed in order to remove its precious treasure. Regardless of their history, pearls remain one of the most popular gems in jewelry. They are one of the birthstones for the month of June, are associated with the zodiac sign of Gemini, and are the gemstone gift of choice for those celebrating their thirtieth wedding anniversary. And to this day, they are still one the most popular and most traditional gems worn by brides on their wedding day because they symbolize modesty chastity, and purity.